The former director of the Pentagon program dedicated to investigating possible sightings of UFOs explains in the importance of continuing with this type of program. W Radio: Mr Luis Elizondo, good morning and thank you very much for being with us at W radio. I would like to ask you if you as an official at the Pentagon, had enough proof, or solid proof, that could lead you to believe that there's life outside of the Earth? Luis Elizando: Thank you very much for having me on your program. What we looked at on our program was two fold - what was it and how it worked? As a result of our analysis and ten years worth of study and information, leads us to believe that these phenomena are not from any one country that we know. So the question is, if they from outer space, or inner space or any space in between, that is a question that we still don't know, but we are fairly certain they're not from here. 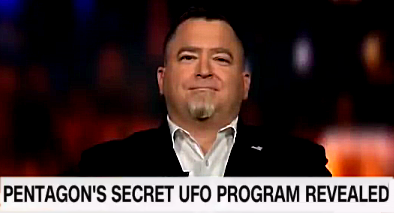 W Radio: Mr Elizondo, why the Pentagon wanted to have a secret program watching the phenomena and these UFOs? Why wouldn't it publish this material this proof or this analysis that the Pentagon had? Luis Elizando: I believe the answer is for two reasons. One, there is a tremendous social stigma or taboo against officially recognizing the phenomena and, two, I believe it is very difficult for any national security apparatus to have identified a problem or potential threat and not offer a solution. In this case you have phenomena that are in a certain air space. We do not know what it is, we do not know how it works, and there's nothing we can do about it. And that is a very uncomfortable topic for any government to have internally or externally. W Radio: Mr Elizondo, from the phenomena and incidents that you knew when you were at this program, what was the one that really surprised you or the one that you said, ok this is what makes me believe that there's life outside of the Earth? Luis Elizando: I think every day was a surprise. There was no one single incident. It was a slow steady flow of information coming in, either through eye-witness accounts or through radar or through video, that began to paint a very compelling picture for all of us. I think furthermore for your listeners' understanding, we are talking about objects that can be sub-categorized in five different observables. Those observables include extreme maneuverability, hyper-sonic velocities, low observability, transmedium travel and, lastly, positive lift without any type of obvious signs of aerodynamics or thrust, or propulsion. These objects are displaying characteristics that far exceed anything we know currently in the world's inventory. W Radio: Mr Elizando, regarding the name of the program at the Pentagon that you worked with, it is described as a 'threat', do you really think there is an actual threat from outer space to the Earth, to our planet? Luis Elizando: I think in national security, we always have to assume anything can be a threat until we can prove it is not a threat.....as an example, we lock our doors and night, we turn on our alarm systems and we lock our windows because there is a potential there might be a threat. There probably won't be, but there might be. In this particular case, if you can imagine waking up every morning and seeing muddy boot prints in your living room, every morning even though you've locked your doors and you've locked your windows and your alarm is on. In this particular case, nothing is stolen from your house, nothing is missing, no-one is hurt but at the end of the day you still have muddy boot-prints that aren't yours in your house. W Radio: Mr Elizando, I would like to ask your opinion around the possibility of this topic that these investigations and analysis, could be a main part of a President Trump administration or that this program could be re-opened in the near future? Luis Elizando: Well, I think that's a very good question. We, in the office that I came from, are all apolitical, meaning we don't get paid to take sides, so whether it's Democrat or Republican or an Independent in office is really inconsequential for us, but our hope is that whoever is in office, whether it's Trump or it's anybody else, we'll look at the data and allow the data to speak for itself, then at that point, hopefully be able to increase funding and the necessary budget to continue the program in a far more robust manner. I think it's important for you listeners to know the program never went away. The program was never officially disestablished. Parts of the funding may have ended in 2012 but then more funding came in 2013 but more importantly than that, is that the effort was never stopped, never halted. So the program continues to move forward and in my opinion, whoever's in charge, whoever is the President at the time, needs to allow the data to speak for itself and increase funding for additional research and analysis into the phenomena. W Radio: Mr Elizando, there are two different scenarios: one is that life in outer space is possible and that it actually exists, and the other one, is that this different life that lives outside of Planet Earth might come to this planet and visit us. So this solid proof remains unknown for us to understand that this life really happens and they might come to Planet Earth. NASA hasn't even recognized this possibility. Why, if you have observed that there is life at outer space, no-one including NASA has recognized it? Luis Elizando: Well, keeping in mind that NASA has already recognized the possibility in fact they funded in part our SETI program. SETI is by definition Search for Extra Terrestrial Intelligence and millions and millions of dollars were invested of US taxpayer money to build radio telescopes for exactly that purpose. I would submit to you, if we are willing to invest millions of dollars on the off-chance we might hear a conversation somewhere in deep space, and here we have pilots who are in charge of multi-million dollar weapon systems with top secret clearances who are telling you they are seeing something right here, right now. I would submit to you, our money is probably better spent listening to the pilots and looking at the hard radar data, and looking at the videos, and trying to figure that out, instead of hoping that we might hear some conversation maybe ten million light years away. NASA has already acknowledged the high degree of possibility that we are not alone in this universe. I am not saying that what we are seeing here is necessarily outer space, or as I said before, or inner space or the space in between. I have my personal opinion. But if it's not from here, it's from somewhere else. The binary discussion of, is it from here, or is it from outer space from an alien or is it not - I'm not sure if that's even the right question because there's a lot of different scenarios and possibilities. I do not think it's an either/or question. I think there are several other options of the origins of what we're looking at. W Radio: Mr Elizando, I would like to know your personal opinion about or around these UFOs might have for coming to Planet Earth or our planet - why would they want to do that? Luis Elizando: All I can do is put this in a human context. So let's look at this question from the human perspective. Why does mankind do anything we do and why do we explore the horizons? Sometimes we explore the horizons for our sheer curiosity. It's in our DNA, it's in our genetics. Other times we explore to exploit - to take resources and to do something that is to our advantage as a species. Other times we do it to study and to learn. There's many reasons why mankind goes... pushes the limits and goes beyond his horizon and it could well be the same thing for any other living organism out there. Again I can only speak to the intentions looking at mankind and our history, why we do what we do. There could be a whole range of reasons: they could be natural resources, it could be the fact that hydrogen is so abundant here in a very dense form with water, it could be to observe our evolution as a species, it could be reconnaissance, in some cases I've heard people say it could be what we refer to as preparation of the battlefield, you know, to determine if this planet we live on is something... that is something attractive for another species. I can't answer that question very well, cos it's simply put - I just don't know. I think there's a whole, if you will, spectrum of reasons why something or someone should be interested in this planet. Why are we interested in Mars? Why are we interested in putting mankind on Mars? Why are we interested in putting human beings in outer space in space stations? W Radio: Well Mr Luis Elizando thank you very much for being with us on W Radio. Have a good day.